Today is Thursday. Today a couple of people were brought to my attention. Have you ever met folks who desperately needed affirmation and acceptance that they would do pretty much anything to get these things? The need to feel wanted is so strong that these people are vulnerable to manipulation and abuse. The line between right and wrong becomes blurred and loyalty will shift to whomever provides the most attention at the moment. I have watched young women who do not love themselves, do not have confidence in who they are, do not believe they deserve to be treated with dignity fall prey to abusers, controllers, informants (the worse type of manipulaters). These women put themselves in danger and many times others who are associated with them. Focus on someone who is suffering and work to help that person not for your glory but for meaning, for love, for that person’s benefit because you will discover that you do matter. If you learn to love yourself and treat yourself with dignity, you will find others will do so too. Don’t sacrifice your integrity for anyone! Today is Wednesday. Today was an emotional day. Today a young person committed suicide. I know the family and the young person was their niece. Today I followed the hearing for Lauri Love. I could only imagine how he felt being questioned. Today I was reminded of someone who had betrayed my family. I am working on the forgiveness part. The one in pain chooses no retaliation, no eye for an eye; instead, a hand, a hug, a kiss of peace. I can see flowers in place of the gun in your hand. I can hear the song of birds in place of your bombs. Faced with the same mortality shares with humanity; starving, struggling humanity. I see a hand up in place of handcuffs. I hear a fed child’s laughter in place of a wailing mother. Taking off the dark glasses adjusting to the light, raising the volume of truth. I see mercy and justice in place of cruelty and peverted law. I hear “how can I help friend” in place of “you are not welcomed” because____. All things are possible if at first Love becomes the words we use; Love becomes the wealth we amass; Love speaks the truth. Today I was able to visit an old welcome centre in Charleston converted to a museum. 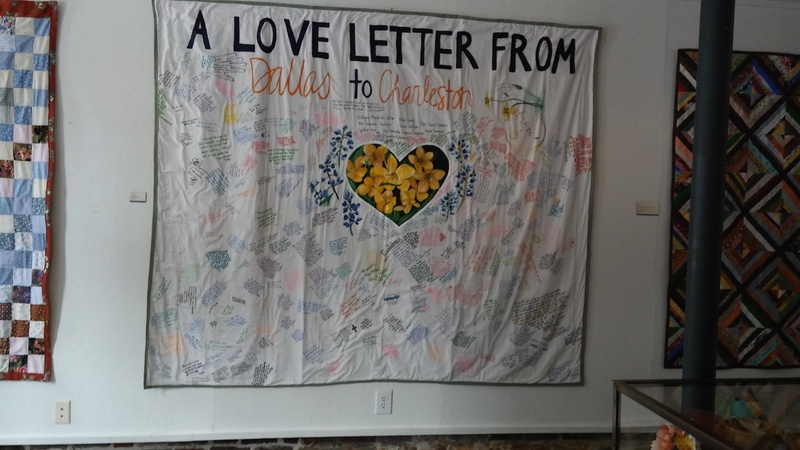 The items on display were some quilts sent in from all over the country, specifically prayer quilts for the grieving members of the AME Church. Today, I was struck by the outpouring of love even from young children as I read messages on some of these quilts. Today, I saw the outpouring of support and love for Lauri Love; not with quilts but with tweets throughout the day. Let’s spread a little love today. How the world needs it. Today is the day before a young man has to stand before people who hold his life in their hands. Today, I have a few words to say to the honourable judge in Lauri Love’s case. I don’t have to wonder how Vicar and Mrs. Love feel about their son. I don’t have to wonder about the thoughts going through their minds as you determine whether young Lauri will be extradited or not to the US to be prosecuted for alleged hacking crimes. I know exactly what they are feeling because I am a US citizen and I have seen first hand the brutality, the corruption, and the injustice perpetrated on my own son as well as others who I support through a personal ministry devoted to providing encouragement, education, clothing, books and funds to the incarcerated. My son was tortured by the FBI for which no official investigation has yet to be filed even though we have sought help to do so. He was charged falsely with a crime and his evidence to prove his innocence was either classified or denied by the US Government. My son spent 4 years in prisons before he was made to plea for a crime he did not commit. He has spent a year in a dungeon-like basement with brown recluse spiders. His father and I have spent a great deal of money trying to provide nutritious food as my son did not get enough vitamin C or protein in one of the prisons. He suffered with an infected cavity with no treatment other than an aspirin he had to pay for. As my son was being transferred to another facility, he was made to stand outside for over 2 hours in nothing but boxers in the pouring rain in temperatures of 4 degrees celsius while those transporting him sat in their car. I have watched with immense frustration and deepest grief how the rights of an an average citizen are trampled and the Constitution is ignored. The rumours of solitary confinement, brutal beatings, random acts of murder, poor food, poor or no medical care and lengthy barbaric sentences are not rumours at all but in fact are true realities here for so many people in prisons in this country. As a mother of a son in prison, as a supporter for many other prisoners and as a US citizen, I ask you with all sincerity and humility, Judge Tempia, that you protect Lauri Love by refusing to extradite him to an injust and barbarous system will not be able protect the life, the dignity and tbe humaity of a British citizen whise fate you now hold in your hands. Today is Sunday. Today I toured the old beautiful city of Charleston. Today, I saw the old slave market now turned into a place where vendors sell their wares. It made me sad to think about human beings treated as commodities. I passed by the AME church where people had been murdered during a Bible study. I said a silent prater for their families. Today, I stopped by the bay and realized how much I miss the ocean. I grew up 9 miles away from the ocean and I love the water. Today was a perfect day to be alive and feel the ocean breeze, see the summer blue sky, hear an older man singing the blues, and breath in the salty air. I will not take for granted this day that my son and so many others can just imagine. I enjoyed it for him. Today is Saturday. Today I am in Charleston. Today, I am really grateful for kind friends who want to give Paul and I a time to chill and decompress on their expense. Today, I am grateful for friends and supporters I have yet to meet who want to come to visit Paul and me. Today, I am thankful for a compassionate lawyer and friend down South who has been so supportive to my son. Today, Lauri Love is on my heart and my prayer is that he remains in the UK and free. Today…I wish you peace in an unpeaceful world…hugs. Today is Friday. Tonight I am in the Smokey Mountains of NC. As the day began to slip into the evening, mountains bathed in the golden glow of a retreating sun suddenly rose up before me majestic, immense, beautiful. Today, I wished my son could experience what I was seeing and feeling. He called and expressed his sincere happiness that his parents were going to spend a few days chilling out. Paul has a good friend who has offered to keep us and show us his city of Charleston. Today, I thought about drawing some of what I see and send it to Matt..something every day. Mountains…like big issues in life need to be climbed so eventually we can stand in the golden glow.